Featuring Leifang, Hitomi, and the "Forbidden Fortune" stage. Koei Tecmo and Team Ninja have released a new trailer for Dead or Alive 6 “T’ai Chi Ch’uan Prodigy & The Fist Of Innocence” featuring newly confirmed characters Leifang and Hitomi, as well as the new “Forbidden Fortune” stage. Two of the most prized characters in the Dead or Alive universe are set to make their return to action as we announce today the addition of Leifang and Hitomi to the Dead or Alive 6 roster. Leifang and Hitomi jump into the action alongside a freshly-added stage the “Forbidden Fortune” at Gamescom! Leifang, known as the T’ai Chi Ch’uan Genius, is the master of using her opponent’s power against them, countering assaults thanks to her flawless Sabaki and Inashi parries. She employs a variety of effective holds to gracefully counter enemy attacks, all the while hoping to prove her strength and capabilities as she pushes forward through the DOA Tournament. Joining Leifang in Dead or Alive 6 is “The Fist of Innocence,” Hitomi. The 20-year-old of mixed German and Japanese descent is a well-balanced karate expert; utilizing speed, power, and a long reach to take down opponents thanks to a straight punch that is equally beautiful and terrifying. 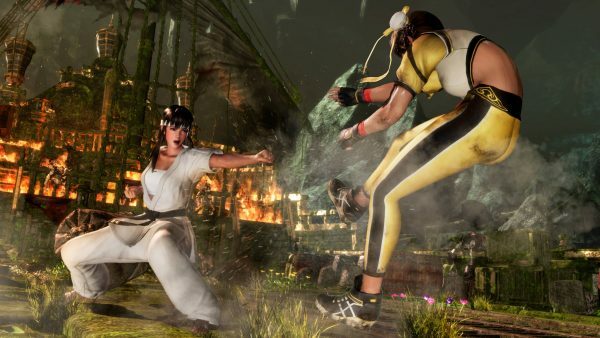 Hitomi specializes in using techniques that combine both offensive and defensive elements in one smooth strike. The two fighters will be highlighted at Gamescom on a freshly-added stage entitled Forbidden Fortune. The dynamic level features the ruins of an old pirate ship, with shattered bones scattered across the top deck, and mountains of gold found below as combatants smash through to the hull to find not only the hidden treasure but a slew of hidden traps – not to mention, a giant Kraken guarding the stolen loot. As the Kraken becomes enraged, the ships rocks and shudders, and as the damage spreads to the armory, sparks begin to fly, including gunpowder that catches fire, shooting violent flames over the scene of the fight. Dead or Alive 6 is due out for PlayStation 4, Xbox One, and PC in early 2019.